FRAMINGHAM, Mass., December 1, 2017 – The worldwide Ethernet switch market (Layer 2/3) recorded $6.75 billion in revenue in the third quarter of 2017 (3Q17), an increase of 7.4% year over year. Meanwhile, the worldwide total enterprise and service provider (SP) router market recorded $3.91 billion in revenue in 3Q17, increasing strong 9.4% on a year-over-year basis. These growth rates are according to results published in the International Data Corporation (IDC) Worldwide Quarterly Ethernet Switch Tracker and Worldwide Quarterly Router Tracker. 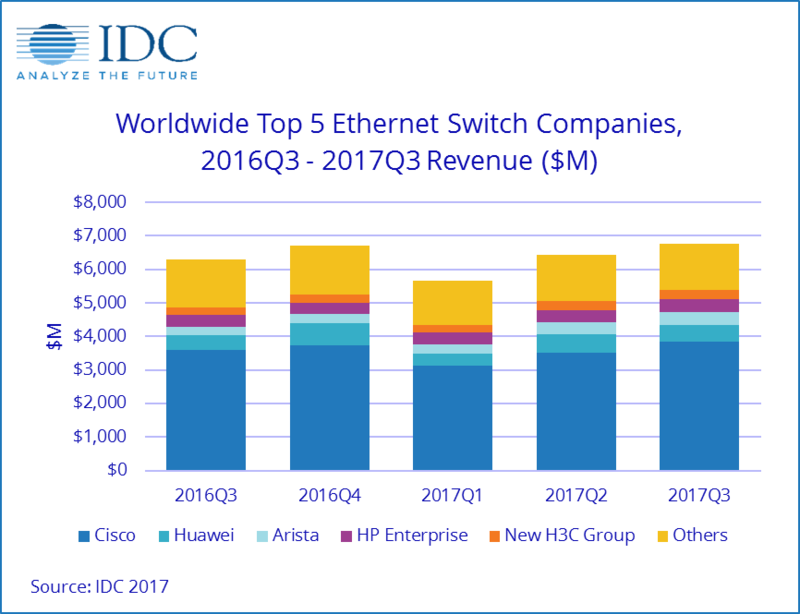 From a geographic perspective, the 3Q17 Ethernet switch market saw strong performance across the globe. The Central and Eastern Europe (CEE) region saw the best results in 3Q17, growing 16.6% year over year. Within CEE the best performing countries were the Czech Republic (up 47.3% year over year) and Hungary (up 40.2% year over year). Asia/Pacific (excluding Japan)(APeJ) and Western Europe both increased more than 12% year over year (12.6% and 12.4%, respectively) in 3Q17. Notable country results within APeJ and Western Europe include China with a strong 19.4% increase, Germany (up 23.2%), and India (up 18.2% year over year). On the other hand, United Kingdom (UK) continued to be impacted by uncertainty surrounding Brexit and declined 3.2% year over year in 3Q17. Japan grew in double digits and was up 11.4% year over year in 3Q17. Latin America's solid 7.7% increase was on par with the overall market. Somewhat lagging the overall Ethernet switch market was North America with its 3.4% year-over-year increase. The only region that experienced a decline was Middle East & Africa (MEA) this quarter, going down 1.2% year over year. "Strong application-related infrastructure and services requirements at the edge and core are continuing to complement significant cloud buildouts, keeping the demand side humming for network infrastructure," said Rohit Mehra, vice president, Network Infrastructure at IDC. "In parallel, connecting the edge to the core and cloud requires upgrades to WAN connectivity for which we continue to see increasing demand across enterprises as well as service providers, leveraging the architectural disruptions from areas like SD-WAN and mobile backhaul." 100Gb Ethernet switch revenue continues to grow rapidly as adoption by hyperscale and other cloud providers, as well as large enterprises, continues to accelerate. 100Gb shipments reached almost 1.2 million ports and $608 million in revenue. 100Gb now accounts for 9.0% of the total market revenue, up from just 3.6% in a quarter a year ago. 25Gb/50Gb Ethernet switch products are starting to gain traction as well, and in 3Q17 shipments exceeded 750,000 ports and $85 million in revenue. As expected, the growth in 25Gb, 50Gb, 100Gb is negatively impacting the 40Gb segment. 40Gb shipments decreased 36.7% year over year and revenue was down 20.0% year over year in 3Q17. 10Gb experienced solid results in 3Q17 with shipments growing 49.6% year over year and revenue increasing 5.2% year over year. Meanwhile, 1Gb as the primary connectivity technology for enterprise campus and branch deployments continues to account for a majority of the Ethernet switching market. 1Gb port shipments reached 105.9 million ports after growing 10.6% year over year and now accounts for 66.6% of all ports shipped in 3Q17. In terms of revenue, 1Gb increased 2.4% year over year and accounts for 42.6% of revenue. The worldwide enterprise and service provider router market grew 9.4% on a year-over-year basis in 3Q17 based on a strong 14.8% increase in the larger service provider segment and a 6.3% decrease in enterprise routing. This will be a market to watch closely over the coming quarters as software-defined architectures start to take hold across the WAN, with the potential for SD-WAN to disrupt traditional routing architectures and WAN transport services markets especially at the network edge. The combined enterprise and service provider router market saw a varied regional performance in 3Q17, with APeJ recording the strongest growth (up 31.7% year over year). MEA also performed well, growing 8.9% year over year in 3Q17. CEE, North America, and Japan all saw mid-single digit growth in 3Q17, up 5.6%, 4.8%, and 4.8%, respectively. Western Europe declined 4.7% on an annual basis, while Latin America decreased 15.9% year over year in 3Q17. Cisco finished 3Q17 with a year-over-year increase of 6.8% in the Ethernet switching market and market share of 56.7%, up from its 54.7% share in 2Q17 but slightly down from 57.0% in 3Q16. In the vigorously contested 10GbE segment, Cisco held 53.3% of the market in 3Q17, up from 51.6% in the previous quarter. Cisco saw its combined service provider and enterprise router revenue increase 3.0% on an annual basis, while its market share came in at 41.4% in 3Q17, up from 40.8% in 2Q17, but down from 44.0% in 3Q16. Huawei continued to perform well in both the Ethernet switch and the router markets on an annual basis. Huawei's Ethernet switch revenue grew 14.1% year over year in 3Q17 for a market share of 7.7%, up from 7.2% in 3Q16. Huawei's enterprise and SP router revenue increased 44.0% over the same period to finish with 21.9% of the total router market in 3Q17 compared to 16.6% in 3Q16. Hewlett Packard Enterprise 's (HPE) Ethernet switch revenue increased 7.5% year over year in 3Q17 and its market share stands at 5.5%, down from 5.6% in 2Q17 but flat on an annual basis. (Note: HPE and H3C are tracked separately as of 2Q16). Arista Networks performed well in 3Q17 with its Ethernet switching revenue rising 49.6% year over year and earning a market share of 5.6%, up from 4.0% in 3Q16. Juniper's Ethernet switching decreased by 4.2% year over year in 3Q17 bringing its market share to 3.2% versus 3.5% in 3Q16. Juniper also saw a 5.6% year over year decrease in combined service provider and enterprise router revenues, with market share of 15.0% compared to 17.3% in 3Q16. H3C's Ethernet switch revenue, which is fully coming from the PRC and Hong Kong markets, grew 37.3% year over year in 3Q17. H3C is finding success both in the enterprise as well as with the PRC cloud providers. H3C's enterprise router business also performed well and increased 50.9% year over year in 3Q17. "Among the major regions, North America was the outlier this quarter with somewhat weaker growth, whereas some key countries and regions outdid the market with a significantly high growth uptake in the switch and router segments respectively," said Petr Jirovsky, research manager, Worldwide Networking Trackers. "There are opportunities for emerging OEM and ODM vendors to gain share while challenging more established vendors to rethink how they compete." The Worldwide Quarterly Ethernet Switch Tracker and the Worldwide Quarterly Router Tracker provide total market size and vendor shares for the Ethernet switch and router technologies in an easy-to-use Excel pivot table format. The geographic coverage for both the Ethernet switch market and the router market includes eight major regions (USA, Canada, Latin America, Asia/Pacific (excluding Japan), Japan, Western Europe, Central and Eastern Europe, and Middle East and Africa) and 60 countries. The Ethernet switch market is further segmented by speed (100Mb, 1000Mb, 10Gb, 25Gb, 40Gb, 50Gb 100Gb), product (fixed managed, fixed unmanaged, modular), and layer (L2, L3, ADC). Measurement for the Ethernet switch market is provided in vendor revenue, value, and port shipments. The router market is further split by product (high-end, mid-range, low-end, SOHO), deployment (service provider, enterprise), connectivity (core, edge), and the measurements are in vendor revenue, value, and unit shipments.